With 785 locations statewide for instruction, discovery and community outreach, CFAES is making headway on a comprehensive facilities improvements strategy. An extensive re-envisioning of Waterman Farm, west of the Columbus campus, to include a new multi-species arena, stalls for temporary housing of livestock for teaching purposes, an undergraduate research lab, a greenhouse for CFAES to partner with Ohio State Dining Services, a Franklin County Extension office, and an institute to study urban agriculture and food security. A new beef center that consolidates livestock and resources at Don Scott Field in northwest Columbus. A new swine research center that unifies swine livestock and resources on the Wooster campus. Enhanced equine facilities in partnership with Ohio State’s College of Veterinary Medicine. 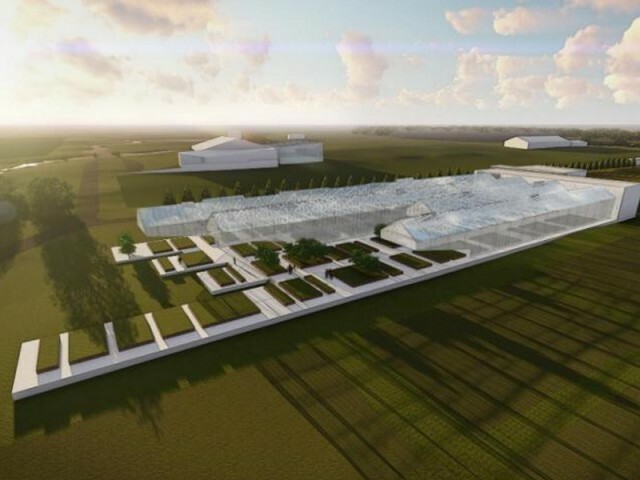 Because of Waterman’s mission to achieve global food security by leading research in aquaculture, hydroponics and urbanized farming, the architects are proud to play a role in the project, among others, Erdy McHenry principal Scott Erdy said. “Taking these initiatives now is imperative if we are to ensure a sustainable planet for the future,” Erdy said. In addition, various animal species will be relocated statewide in an effort to minimize herd redundancies. “We want to have the most impact and bring the greatest benefit to the college,” said Brian Hanna, CFAES director of facilities and capital planning. In Wooster, a planned agbiosciences building will encourage collaborative research and will add undergraduate classrooms and wet labs for Ohio State’s Agricultural Technical Institute. This facility is expected to serve graduate and undergraduate researchers, encourage partnerships with private organizations, and provide more teaching opportunities. Also, visitors to the Wooster campus will see new lights, landscaping and road improvements. Throughout the state, many research labs, classrooms and barns need renovation, replacement or infrastructure upgrades, Hanna said. The college has also launched an aggressive fundraising campaign around its facility plans. Two key gifts have kicked off this initiative: Lee Smith, a friend of the college, has provided a creative real-estate donation in support of the equine facilities. Also, the Ohio Cattlemen’s Association made the first gift toward the beef center at Don Scott. In an ongoing dialogue with the college, the association has been advocating improvements necessary to bring the beef facilities on par with what should be expected from Ohio State as it educates the next generation of industry leaders, Executive Director Elizabeth Harsh said. “Hopefully it signals beyond the monetary gift that the association wants to be a leader to help with the broader fund raising effort to encourage others to step forward, as more resources are needed,” Harsh said. “A strong animal science department that is equipped with up-to-date facilities to serve its students, faculty and staff contributes to a strong beef industry in the state of Ohio,” she said.